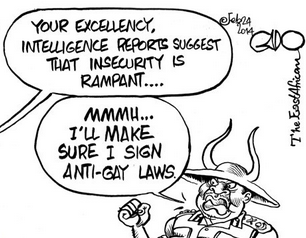 It’s not only in Uganda and Nigeria that homophobic legislation has come into force. Indian and Kenyan legislators are happy to demonstrate their basic intolerance of civil liberties. Gado is as always spot on illustrating both the dysfunctionality of such governments and their efforts to demonise private behaviour. They are disingenuously unwilling to support people living in squalor, going hungry, jobless, let alone enjoying basic rights, yet find themselves unable to bear the idea of consenting adults sharing love.